(NaturalNews) Herbs played a huge role in Egyptian medicine. Proof comes from burial sites, tombs and underground temples where archeologists have found extensive sets of medical documents and scrolls, including the Ebers Papyrus, the Edwin Smith Papyrus, the Hearst Papyrus, and the London Medical Papyrus, which contained the earliest documented awareness of tumors. The most famous plant - medicine "encyclopedia" is the Ebers Papyrus, a 110 page scroll which rolls out to be about 20 meters long. Egyptians consumed raw garlic and onions for endurance and to heal asthma and bronchial-pulmonary issues. Many of their herbs were steeped in wine and used as oral medicine. These were natural herbs, untainted by pesticides, herbicides, insecticides, or fluoridated water. The Egyptians documented use of myrrh, frankincense, fennel, cassia, thyme, juniper, and even aloe. Fresh garlic cloves were peeled, mashed and macerated in a mixture of vinegar and water and used as a rinse for sore throats and toothaches. Egyptians knew about the healing powers of honey. In fact, the first official recognition of the importance of honey dates back to the first Egyptian Dynasty and the "Sealer of the Honey." In Niuserre's Sun temple, bee-keepers are shown in hieroglyphics blowing smoke into hives as they are removing honey-combs. The honey was immediately jarred and sealed and could therefore be kept for years, and it was used for the production of medicines and ointments. They even used it as a natural antibiotic. The main land for bee-keeping was in Lower Egypt where there was extensive irrigation feeding thousands of flowering plants. The Bee was chosen as a symbol for the country and the gods were associated with the bee. One pharaoh's title was Bee King and his Royal archers protected the bees like they were his holy temple. The temples were actually homes for the bees, in order to satisfy the desire of the gods. Canaan was called the "Land of Milk and Honey" in the Hebrew tradition. Egyptian medicine is some of the oldest ever documented. From the 33rd century BC until the Persian invasion in 525 BC, Egyptian medical practice remained consistent in its highly advanced methods for the time. Homer even wrote in the Odyssey: "In Egypt, the men are more skilled in medicine than any of human kind," and "The Egyptians were skilled in medicine more than any other art." The Edwin Smith papyrus is still benefiting modern medicine, and is viewed as a learning manual. Treatments consisted of ailments made from animal, vegetable, fruits and minerals. But the Ebers Papyrus is the most voluminous record of ancient Egyptian medicine known. The scroll contains some 700 remedies including empirical practice and observation. The papyrus actually contains a "treatise on the heart," which recognizes the heart as the center of the blood supply, with vessels attached. Even mental disorders, depression and dementia were detailed in one of the chapters. The Egyptians were treating intestinal disease and parasites, eye and skin problems, and even abscesses and tumors. • Pomegranate root was strained with water and drunk to address "snakes of the belly" (tapeworms). The alkaloids contained in pomegranate paralyzed the worms' nervous system and they relinquished their hold. Disease was not uncommon in Ancient Egypt. There were many skin afflictions and parasites from the Nile river waters. Worms and tuberculosis were common, sometimes transmitted from cattle. Pneumonia struck people who breathed in too much sand into the lungs during sand storms. But the Egyptian physicians took full advantage of the natural resources all around them in order to treat common ailments. Many of their methods are still very viable today and are considered part of the homeopathic world of medicine. Thanks to diligent record keeping, scholars have been able to translate the scrolls and appreciate what the Egyptians knew back then about anatomy, hygiene, and healing. Those scrolls, without question, paved the way for modern medicine. 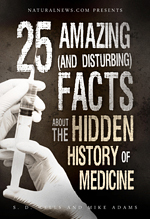 shocking history of psychiatric medicine and much more.